I'm looking for a decent DC power supply to test my cell before i put it in my truck. I donâ€™t have an extra car battery or charger and donâ€™t want to run my truck while i do testing. I did some searching but couldnâ€™t really find what i was looking for. Just a box that you plug into the wall, with a couple of dials and gauges for voltage and amperage, and a + and - terminal. Is that the kind of thing you guys use and where did you get it? cyborgmexican Wrote: I'm looking for a decent DC power supply to test my cell before i put it in my truck. I donâ€™t have an extra car battery or charger and donâ€™t want to run my truck while i do testing. I did some searching but couldnâ€™t really find what i was looking for. Just a box that you plug into the wall, with a couple of dials and gauges for voltage and amperage, and a + and - terminal. Is that the kind of thing you guys use and where did you get it? I would try either a 12 V battery or buy a Battery jump box that is what I use or perhaps some type of higher voltage battery charger! But watch and don't leave it on for very long because they elctrolyzers can draw a battery down quite quickly especially the plate or pipe design ones. And some of the wire wrap types heat up really fast as well. I think it has to do with the idea the ss wires I think should be insulated with electric tap[e or heat sink or something to some degree to a little below the water line but nobody ever does this because they don't show it even in the instructions. But the trickle chargers don't do much good except for maybe curing or preparing your plates or testing your unit for long periods say a day or several days. Does anybody know if you can leave the battery jump box plugged in while testing a unit? I use a Pyramid PS-36KX. Puts out up to 35 amps, has volt and amp gauge built in. A good investment if you plan to jump into this with both feet. Here's one listing on e-bay right now. 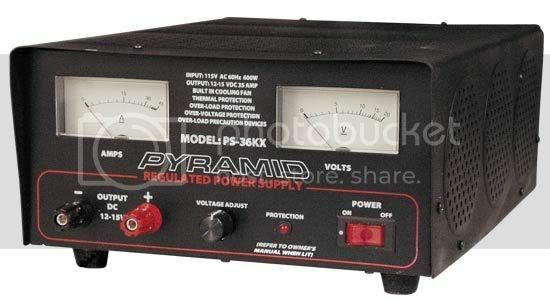 Just go to ebay and search for "Pyramid Power Supply" you'll find a bunch, pick the max amps you want and pick one up! During experimentation you can easily use the 35 amps so if you can swing it, get this model or larger.